Home / Article / Featured / The 2018 Global Game Market: how big is the mobile game market. The 2018 Global Game Market: how big is the mobile game market. Sometime in June 2018 the progressive analytical data of various video game platforms surfaced, though with a mixed feeling but it really got us thinking; is the mobile game closing up on other game genres? The over impressive performance of “the new kid on the block” has actually made all of us wallowing in surprise. According to the latest data released by world most reputable game market trackers “Newszoo”, according to newzoo global mobile game market the mobile game has clinched the position of the most consumed game by world gamers. It comes in two categories, the Tablet Games and the smart phone games. These gadgets has been predicted to accumulate a whopping $70.3 billion at the end 2018 with tablet game amounting to $13.9 billion while its counterpart as in the Smartphone games is expected to take a larger portion with $56.4 billion. Aside these achievements the overall estimation predicted that the video game industry will be ending the year with a $137.9 billion turn over and is also estimated to have a year on year (YoY) growth of +13.3% like we stated earlier, the mobile game sector took the large chunk of the promising cake with $70.3 billion and the YoY rate is expected to raise with +13.1% while smart phones YoY increase is expected at +29.0% other consoles too experience some form of increase. 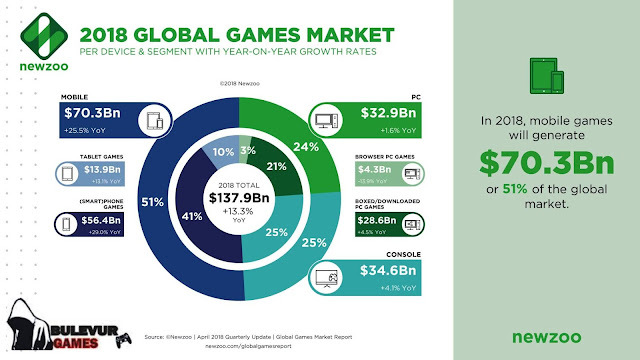 After the mobile game sector comes the console games which according to global video game console market are expected to dupe in a $34.6 billion at the end of 2018 with YoY increase of +4.1%. Surprisingly, the ever fluctuating PC sector didn’t cease to pull off its surprising stunt ’cos this year it will make a rather positive statement this with a $32.9 billion mark with +1.6 % YoY growth, though it took the back sit but hey! It’s better to clinch to the edge than to slip off the cliff. From us at the #BulevurGames the reason for this behavior in the game industry didn’t just come as a surprise ’cos since after the smart phone boom in 2007 the mobile games has been proving its prowess to the detriment of the PC game. This has darely affected currently which country leads the mobile game market by this progress. But be it as it may, the console games has also proven to be “enviable fortress of Masada” that can never be moved from its position with a slight notch, it’s relevance to gamers can never be compromised even with the outburst of mobile gaming.